We’d love your help. Let us know what’s wrong with this preview of The Qwikpick Adventure Society by Sam Riddleburger. Lyle Hertzog and his two friends Marilla and Dave have no plans for Christmas Day. They’ll probably just hang out at the local Qwikpick like they always do. But when an article in the hometown newspaper catches their eye, suddenly the three friends (aka members of the Qwikpick Adventure Society) realize that they must venture forth for a farewell tribute to the old sludge fountain at the nearby sewage plant. This is their last chance to see, up close and personal, the “fountain of poop” working its wonders! First-time author Sam Riddleburger has created a humorous and Daniel Pinkwater–esque novel about a Stand by Me type of journey that will both test and strengthen the bonds of friendship between three kids in smalltown America. To ask other readers questions about The Qwikpick Adventure Society, please sign up. As a children's book reviewer there is one fact that you must keep at the forefront of your mind at all times: You are not a kid. Not usually anyway. And because you are not a kid, you are not going to read a book the way a kid does. I keep talking in my reviews about how your own personal prejudices affect your interpretation of the book in front of you, but it's bloody true. I mean, take scatological humor in all its myriad forms. When I read Out of Patience by Brian Meehl last year I really e As a children's book reviewer there is one fact that you must keep at the forefront of your mind at all times: You are not a kid. Not usually anyway. And because you are not a kid, you are not going to read a book the way a kid does. I keep talking in my reviews about how your own personal prejudices affect your interpretation of the book in front of you, but it's bloody true. I mean, take scatological humor in all its myriad forms. When I read Out of Patience by Brian Meehl last year I really enjoyed it until the moment when the local fertilizer plant became... well, you'd have to read the book to grasp the full horror of the situation. Actually, "Out of Patience" was the title I kept thinking of as I got deeper and deeper into "The Qwikpick Adventure Society". Both books are funny and smart and both involve gross quantities of waste to an extent you might never expect. I am an adult. I have a hard time with poop. Poop aside (and that's saying something) there's a lot of great stuff going on in this book. It's definitely a keeper, but it's going to have a hard hard time winning over its primary purchasing audience, adults. Lyle Hertzog is going to level with you right from the start. In this story he and his friends, "didn't stop a smuggling ring or get mixed up with the mob or stop an ancient evil from rising up and spreading black terror across Crickenburg." Nope. This is the story of Lyle, Dave, and Marilla and their club's first adventure. The kids say that they're The Qwikpick Adventure Society because they meet regularly in the break room of the local Qwikpick convenience store where Lyle's parents work. When it occurs to the three that they'll all be available to hang out on Christmas Day, they decide to do something extraordinary. Something unprecedented. And when Marilla discovers that the local "antiquated sludge fountain" at the Crickenburg sewer plant is about to be replaced, they know exactly what to do. They must see the poop fountain before it is gone. The result is a small adventure that is exciting, frightening, and very very pungent. There are few kid-appropriate taboo topics out there, but if I was going to suggest one I might say it was the issue of class. Oh, you'll get plenty of books where a kid lives a miserable life in a trailer park and gets teased by the rich/middle class kids in their class about it, sure. Now name all the books you can think of where the main characters live in a trailer park and that's just their life. Or have parents that work in a convenience store and there isn't any alcohol abuse, physical abuse, emotional abuse, etc. I swear, a kid who actually lived in a trailer park these days who tried to find a book containing kids like themselves would have to assume that abuse was the norm rather than the exception. So when I saw that both Lyle and Marilla lived in a trailer park and it wasn't a big deal, that was huge for me. Also, sometimes a book with kids of different religions or ethnicities will make a big deal about the fact. Here, Lyle's Christian, Dave's Jewish, and Marilla's a Jehovah's Witness and not white but not identified as anything in particular. Quick! Name all the Jehovah's Witnesses you've encountered in children's books where the story wasn't ALL about being a Jehovah's Witness! Riddleburger is making people just people. What a concept. This is my own book so you better believe I'm giving it 5 stars! heck people, it's got origami AND crab soccer. What more do you want? Millions of gallons of liquid sewage? We've got that, too. You just can't miss, folks. There's something we adult readers of this book need to keep in mind. It's a kid's book, and kids like a good gross-out the same way they like a good scare, or creepy tale. We adult readers need to keep that in mind, and keep our senses of humor about us for this one. It's entirely believable that kids would go to see a doomed "poop-fountain", and that real kids will get some laughs reading about it. And underneath that lies a very good story. If it takes the poop factor to entice kids to give i There's something we adult readers of this book need to keep in mind. It's a kid's book, and kids like a good gross-out the same way they like a good scare, or creepy tale. We adult readers need to keep that in mind, and keep our senses of humor about us for this one. It's entirely believable that kids would go to see a doomed "poop-fountain", and that real kids will get some laughs reading about it. And underneath that lies a very good story. If it takes the poop factor to entice kids to give it a try, I can live with that. Regular kids - good kids, doing and thinking regular kid things - and it's quite fun! Takes me back to the good days of childhood. Completely enjoyed it. I think kids will get a kick out of it. I liked the use of photos, and "handwritten" notes with the typed text. Captures the voice of a kid, without falling into the annoyingly childish. Many may look at this book and think of it as a boy book, and perhaps more boys than girls will like it. But I wouldn't put it firmly in the "boy book" catagory. There's a girl among the three pals, so girls have someone they can identify with. And while I know potty humor is typically more interesting to boys, there's more to this story than poop - and the poop that's there has a purpose (although a stinky one). I think more girls will enjoy this than we grown-ups might assume. There are really many things I like about this story. It's great to have a story about kids that have both parents, whose parents can't afford the newest gadgets or in-style clothes for their kids. Where the kids come from regular, and presumably happy families. This story gives kids like that characters they can relate to. It's also nice that there are differences of religion, and race between the main characters, but that it's merely differences accepted that don't really matter. The way normal kids usually treat these things, if adults don't interfere. I'm always glad to find books to use with my relutant reader tutoring student - this one fits the bill! Hope there's more to come - although how you'd match a fountain of poop I don't know. I really liked the perspective in this book. Beverly Cleary once said that she wrote the books she did because at the time there were no books about just regular kids. The Qwikpick Adventure Society fits this description. Lyle is a pretty thoughtful working class kid who lives in a trailer and his folks both work at the local convenience store. Lyle, Dave, and Marilla are friends despite many differences (Among many other things: Marilla is a Jehovah's Witness, and Dave's family is economically I really liked the perspective in this book. Beverly Cleary once said that she wrote the books she did because at the time there were no books about just regular kids. The Qwikpick Adventure Society fits this description. Lyle, Dave, and Marilla are friends despite many differences (Among many other things: Marilla is a Jehovah's Witness, and Dave's family is economically comfortable). 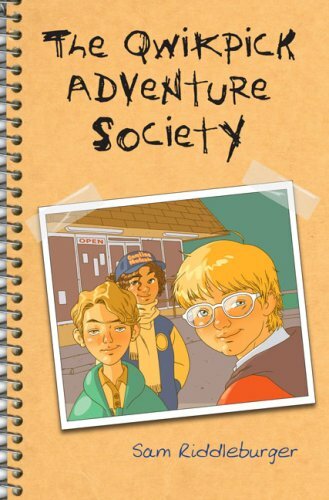 They are looking for adventure in their boring town, so they form this society. After learning about it in civics class, they set out to see the poop fountain at the local sewage treatment plant before it's replaced. 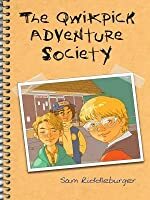 The Qwikpick Adventure Society is not truly a "society," and "Qwikpick" is the name of the convenience story where Lyle, Marilla, and David hang out together. And the adventure, well, visiting a sewage treatment plant can be an adventure when (a) one sneaks in (b) on Christmas Day (c) and a fountain of poop in involved. Lyle, a misfit who has somehow formed a friendship with Marilla and David, is the narrator of this tale written as a "true" report with Lyle's annotations about his experiences The Qwikpick Adventure Society is not truly a "society," and "Qwikpick" is the name of the convenience story where Lyle, Marilla, and David hang out together. And the adventure, well, visiting a sewage treatment plant can be an adventure when (a) one sneaks in (b) on Christmas Day (c) and a fountain of poop in involved. Excellent pick for reluctant readers -- the How to Eat Fried Worms for the 21st century. Be warned: the crux of the plot deals with breaking into a sewage treatment plant in order to view a literal fountain of excrement. Sooooo . . . don't read this while eating, or if you're prone to nausea. Lyle, Marcilla and Dave take a Christmas Day hike to see the fountain of poop that will soon be shut down in their down. Seriously, is that not enough to make you want to read this book? Yes, it's about poop. Yes, it's really gross at times, but yes, it's a good read. Those third and fourth grade boys who love Captain Underpants will totally get this story. It's not a slap stick book and the grossness isn't totally overboard (I only gagged a little), but I actually finished the story thinkning it Lyle, Marcilla and Dave take a Christmas Day hike to see the fountain of poop that will soon be shut down in their down. Seriously, is that not enough to make you want to read this book? Yes, it's about poop. Yes, it's really gross at times, but yes, it's a good read. Those third and fourth grade boys who love Captain Underpants will totally get this story. It's not a slap stick book and the grossness isn't totally overboard (I only gagged a little), but I actually finished the story thinkning it was kind of sweet. Tom Angleberger's first book is funny. I mean, cry and laugh so hard you won't be able to read out loud to your children kind of funny. It is, after all, about a poop fountain. Yes, a poop fountain. It's a great story about friendship, adventure, and poop. I highly recommend reading to students because really, who doesn't enjoy being grossed out hearing about poop?! The three kids that make up the Qwikpick Adventure Society discover that the Poop Fountain at the Wastewater Treatment Plant will be closing. What better place to sneak into on Christmas when all three are left to their own devices! Lightly humorous, love the characters, and only the second kid's book I've read where the main characters live in trailers. If you like Origami Yoda or Horton Halfpott, you should give Tom's first novel a try. It is a super fun read centered around a poop fountain. See review for The Qwikpick Papers. Incredibly convincing voice. Real scenario. This takes place near where I grew up and if I hadn't known that, I still would have recognized it. Clever, hilarious, and very well-drawn characters and relationships. I read this with my 5th grader. Very funny - it's mostly about poop.